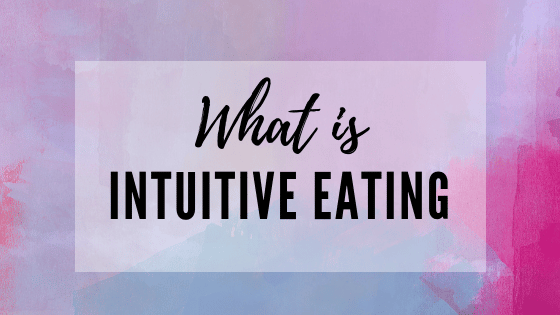 What Is Intuitive Eating and How Is It Different From Mindful Eating? Intuitive eating is a way of eating that has nothing to do with diets, meal plans, discipline or willpower. It’s about getting back to your roots and learning to trust your body again. Here’s an overview of intuitive eating including the science behind it, the ten principles of intuitive eating, and the difference between intuitive eating and mindful eating. I talk about this topic, ditching the diet and healing your relationship with food in my Intuitive Eating Crash Course. Intuitive eating was an approach created by two registered dietitians Evelyn Tribole and Elyse Resch in 1995. Intuitive eating is a non-diet approach to health and wellness that helps you tune into your body signals, break the cycle of chronic dieting and heal your relationship with food. In short: intuitive eating is normal eating. 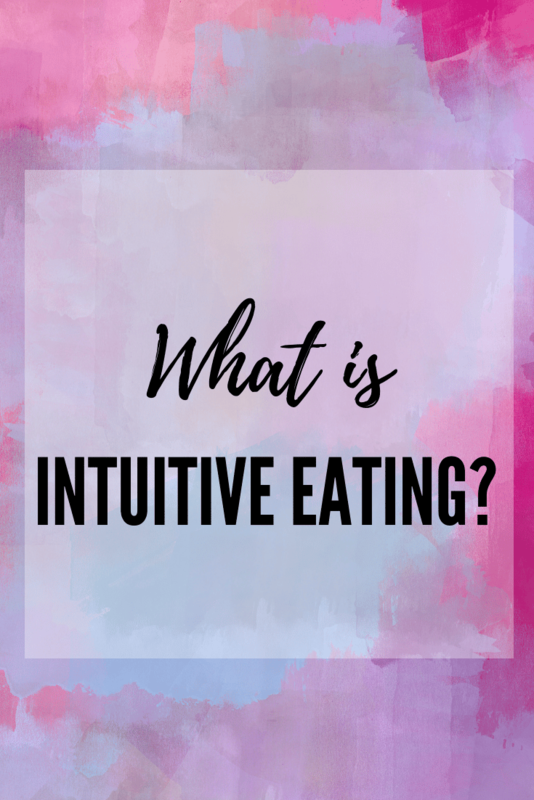 From a nutrition professional perspective, Intuitive eating is a framework that helps us keep nutrition interventions behavior-focused instead of restrictive or rule-focused. We are all born natural intuitive eaters. Babies cry, they eat, and then stop eating until they’re hungry again. Kids innately balance out their food intake from week to week, eating when they’re hungry and stopping once they feel full. Some days they may eat a ton of food, and other days they may eat barely anything. As we grow older and rules and restrictions are set around food, we lose our inner intuitive eater. We learn to finish everything on our plate. We learn that dessert is a reward, or can be taken away if we misbehave. We are told that certain foods are good for us and others are bad – causing us to feel good about ourselves when we eat certain foods and guilty when we eat others. But Intuitive Eating is not the ‘hunger-fullness diet’. Intuitive eaters give themselves unconditional permission to eat whatever they want without feeling guilty. They rely on their internal hunger and satiety signals and trust their body to tell them when, what and how much to eat. They know when they feel like eating veggies and also when they feel like having dessert (and don’t feel guilty or have any regrets with either choice). Intuitive Eating is made up of ten core principles. I’ll be delving into these in more detail in future blog posts, but here is a quick synopsis of each. 1. Reject the Diet Mentality. Think about it: where has your focus on weight loss gotten you to at this point in your life? What has it done to your body? Your mind? It’s not about your lack of willpower or about you being a failure. It’s the system of dieting that is the problem – diets are a set up for failure. Research shows that the act of dieting increases your risk of gaining weight. Remind yourself: if dieting is the problem, how can it be part of the solution? Reject the idea that there are any good diets out there. Get rid of books and magazines that tout diets and easy or quick weight loss. Unfollow social media accounts that propel the dieting myth and diet behaviors (especially those that make you feel bad about yourself). 2. Honor Your Hunger. Hunger is not a four-letter word – it is a normal, biological process. Your body needs to know, and to trust, that it consistently will have access to food. If you try to override feelings of hunger and don’t eat enough calories and carbohydrates, your body reacts with cravings and binges. Are there times when you feel hunger, but didn’t eat? How come? Utilize the hunger-fullness scale to get started with honoring your hunger. 3. Make Peace with Food. Allow all foods into your diet and give yourself unconditional permission to eat whatever you want. Stop categorizing foods as “good” or “bad” – no one food has the power to make you healthy, just like no one food has the power to make you unhealthy. If you tell yourself you can’t have or shouldn’t have a certain food, you will eventually feel deprived; this deprivation builds into uncontrollable cravings and overeating. When you finally “give in” to that food, you’re likely to overeat – since you don’t know when you’ll be able to have it again. This overeating triggers guilt, which starts the cycle all over again: deprivation or restriction –> cravings and overeating –> feelings of guilt. 4. Challenge the Food Police. The food police are the thoughts in your head that declare you as “good” for eating a salad for lunch and “bad” because you ate dessert/carbs/sugar/etc. These are the unreasonable rules that were created by dieting that cause you to feel guilty. These rules are housed deep in your brain and pop up on a daily basis to govern your food decisions. It’s impossible to view eating as a normal, pleasurable activity when the food police have hold. Challenging the food police is an important step towards becoming an intuitive eater. 5. Feel Your Fullness. Dieting causes us to feel like we “have” to eat at meal times – when it is allowed – so leaving food behind can be difficult. Listen for signals that tell you that you are feeling full and satiated. Pause partway through a meal or snack and check in with your body. How does the food taste? How full do you feel? Bring more consciousness and awareness to your meals. Utilizing the hunger-fullness scale can help. 6. Discover the Satisfaction Factor. It’s possible to be physically full but not satisfied. If you’re unsatisfied you’ll probably keep looking for that one thing that is going to make you feel satisfied and content and you’re likely to overeat. When you eat what you really want, the feelings of satisfaction and pleasure you feel will help you be content (and often with less food). 7. Cope With Your Emotions Without Using Food. Emotional eating is very common. We often eat for reasons other than physical hunger and food is often used to cover up unpleasant feelings and emotions. It’s important to find ways to comfort yourself and resolve your emotions without using food. 8. Respect Your Body. We’re so quick to judge ourselves and criticize our bodies. Learning to respect your body for how it is at this moment is an important tenant of Intuitive Eating. If you are too critical of your body and don’t accept yourself as you are, it’s hard to reject the diet mentality. 9. Exercise – Feel The Difference. Instead of focusing on the exercise you think you “should” be doing, shift your focus to what types of movement feel good to you. Forget about the calorie burning effect of exercise and think about how you feel after working out. Do you feel energized? Do you sleep better? If you use exercise only as a way to lose weight or eat more food, it’s not going to be something you will stick with forever. 10. Honor Your Health With Gentle Nutrition. Being healthy doesn’t mean eating perfectly. Consider how certain foods make you feel, in addition to how tasty and satisfying they are to you. One meal or one snack or one day of eating will not cause you to gain weight or have a health problem. It’s the consistency of what you eat over time – it’s not all or nothing. Here are the citations for the intuitive eating research studies. What’s the Difference Between Intuitive Eating and Mindful Eating? Before I started training in Intuitive Eating, I used the terms Mindful Eating and Intuitive Eating interchangeably. While this isn’t totally incorrect, it’s important to note the differences. You can tell right there that Intuitive Eating encompasses the principles of mindful eating. However it goes a step further, also addressing the importance of rejecting the dieting mentality, respecting your body (regardless of your weight or shape), coping with emotional eating, and gentle movement and nutrition without judgment. Both mindful eating and Intuitive Eating can be useful tools to help you reach a place of normal eating. Are you interested in learning more about Intuitive Eating? I absolutely love this post! This fact of why we binge = IT IS BECUASE WE DON’T KNOW WHEN WILL BE THE NEXT TIME WE WILL HAVE THIS CERTAIN FOOD AGAIN; was mind-blowing for me, life changing. It seems quite simple yes, but this wasn’t clear to me, and like a huge AHA-effect. Thank you so much for your post and your blog, it is helping me so much! I was introduced to your website by my nutritionist and I find it very informative. I’ve been trying to read every post. It’s going to take a while to catch up but I intend to read everything very carefully and try to follow your wellness advice. Everything makes perfect sense to me and I look forward to better my eating habits. Thanks for the kind words Goli! I have been in recovery from anorexia nervosa for about three years now. I recovered through mindful eating and still do that, also I didn’t know I was doing intuitive eating but when I read the article I realised yeah that’s what I’m doing like I eat anything that I want to eat and don’t over eat at all etc. I have recently started a job as a dance teaching dancing was one of my main forms of recovery so I use it to help other people find happiness etc. Now that I have a different schedule and work until very late in the evenings I was wondering is it healthy for me to change my eating schedule? I used to eat like three times a day breakfast lunch and dinner and usually a snack in between. I have been taught that meal timing is important lol lik to not deprive yourself or anything. Now I’m wondering if it’s ok to only eat twice a day since I sleep in every morning cus I only start work at 1pm-10 pm. Lik have breakfast at around 10:30/11:00 and then dinner at about 16:00. Then I’ll have a snack around 20:00 or in the afternoon if I like. Is this ok or is it just my eating disorder mentality telling me there is a problem with changing mealtimes😂? I think to me I still have a fear of when to eat I used to be obsessed with what time to eat. I’ve found I don’t really care much anymore it’s just now that my schedule is different I’m thinking this is a easier way to eat. But is it healthy, cus I wake up at like 8:30 and then I’m not hungry until eleven or so. I think I’m scared cus I’ve been told u should eat a half hour after waking up. Is this true? Thanks! Hi Simone, thanks for reaching out! So I can’t give specific advice around eating times without working with you since it sounds like you are in the recovery process. Do you have a therapist and/or dietitian who know you and could give you more specific insight on if this is something that would work well for you? I’m in the process of launching my own blog based on Authentic Wellness. The nutrition piece will be centered on a non dieting approach to healthy eating with a big focus on self acceptance & making peace with our bodies and food! I am so glad I found you in my research! Feeling super inspired that we might have a movement here! Thanks for sharing and leading others to this path! Are these principles presuming everyone has their health. I know some folks who have type 1 and type 2 diabetes. Also some allergies to certain foods. The loving and wise choice for them is to not eat certain foods. Hi Carol, yes, intuitive eating is for everyone! The problem with diets, even if for specific health issues, is that the restrictions can still trigger overeating or binging. So instead of making things off limits (unless there is truly an immediate life threatening situation), start by giving yourself permission to eat all foods. Once you do that, eventually you learn to trust your body and overeating or binging slows. You can then make food decisions based on direct experience & for self-care, rather than because it’s off limits. Sounds like common sense but what about variety in what we eat. Surely it can’t be healthy to eat just a handful of food stuffs even if they satisfy our hunger. Eg, a pizza slice and fries every day. Hi Annette, there’s this belief that intuitive eating means eat whatever you want, anytime you want. But that’s not exactly the case. With Intuitive Eating, you have permission to eat what you want, anytime you want, but that doesn’t mean you always do that. Hunger, fullness, satisfaction, how food makes us feel – those are all important; but Intuitive Eating also means using your brain and life experience. Once you work through the process of getting rid of the diet-y and restrictive voice, you can listen to your brain and make a decision on what to eat that is based on self-care, and one that honors your health and your body’s needs. Hey! I try to stick to intuitive eating, but it’s hard in college. Due to my class/work schedule and dining hall hours, I frequently find myself eating when I’m not that hungry. I have to eat at certain times because it’ll be my last chance to eat for hours (or the night!) I hate doing this as it leaves me feeling sick and over-full (as well as bloated the next day!) How do you approach and fit in intuitive eating with a busy schedule? A strict schedule like this can definitely make it tougher to listen to/be able to honor your hunger/fullness cues. But this is a case where another type of hunger – planned hunger – comes into play. It sounds like you’re helping your body out by eating when you’re able to, though I’m curious about your mention of being sick/over-full. Why do you think that might be? Another thought – is there any way you can keep snacks on hand/bring snacks with you to fill in the gaps when you’re in class? I have recently started eating intuitively. But it was a completely natural process – I got healthier mentally, dealt with all the issues that made me binge & walaaaa I was eating when I wanted, eating way more healthy & didn’t binge. I have not counted calories nor deprived myself once. It’s been the biggest blessing I could’ve given myself. Thank you for sharing this – I hope it resonates in everyone!! The diet culture dooms is all for failure.. no quick fixes, rather a happy sustainable lifestyle so we can be happy long term.